Grim Challenge Wreath, Example by Diva Dan. 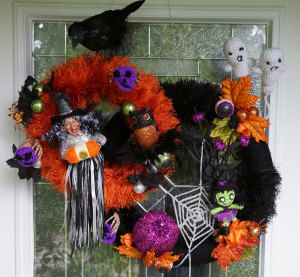 With Halloween just around the ‘cemetery’, what better way to get into the scary and haunting mysterious mood then to decorate your house, especially the creaky front door where you can howl and enchant the trick or treaters as they come dancing down your walkway like goblins in search for candy. 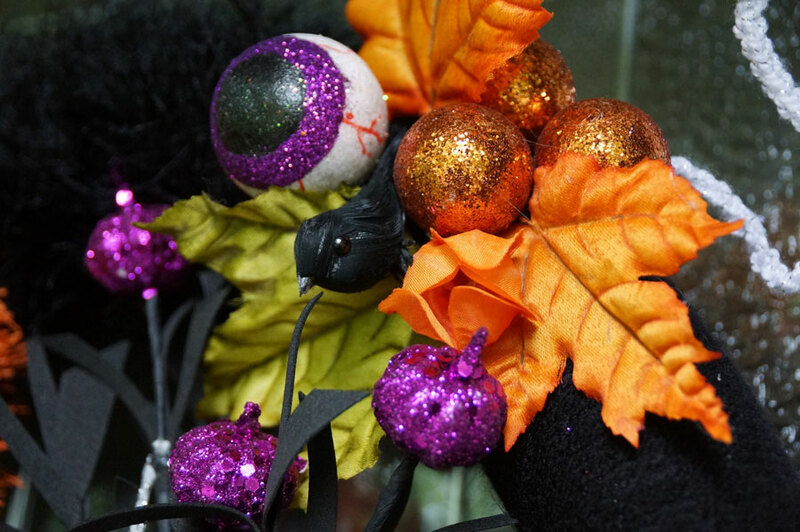 The challenge is to create a nightmarish magical wreath with a Halloween theme. Scary, creative and, of course, trickery fun. This is a ghastly challenge even for the kids. The eerie wreath MUST be made out of YARN! Scary enough???? Don’t let the noisemaker scare you. You know you can do it and you want to. The voices are telling you too! You can do this in any way you like. You can use any means for a base, Styrofoam shaped wreaths, pool noodles duct taped to form a circle, coat hanger etc. Applying the yarn to the base is entirely up to you. No Fortuneteller is needed for this challenge. Diva Dan did his wrapping like a rope with Lion Brands Fun Fur and Fun Yarn but you can, if you wish and to be dared, crochet the wreath as well. The wreath must be in the Halloween theme. If you are not into goblins, witches and bats, there are many other ways to make it look ‘Halloweenish’ with crows, the fall colours, pumpkins and much more. You must have no less then 4 crocheted items on the wreath. So do some searching, there are tons of patterns out there that can give you the chills and jitters. Most importantly, take your time to stretch your imagination and make it fabulous. After all this is going on your front door! One frightful lucky person at the end, will be gifted a fully loaded Lion Brand Bag of enchanting and enticing yarn. Each completed wreath is considered 1 entry. Do as many as you like. We have random draws, unless otherwise stated. It’s a lottery system and everyone has a fair chance. If you decide to do what Diva Dan did applying two wreaths together, (by the way, this is a fabulous idea) that would be consider as two entries providing that you have 4 crocheted items for EACH wreath. Therefore in this case, using math that was taught to us in Grade 1, you would need, How many….. thats right, 8 crocheted items for two wreaths. Of course you can add far more then that to really make it impressive. 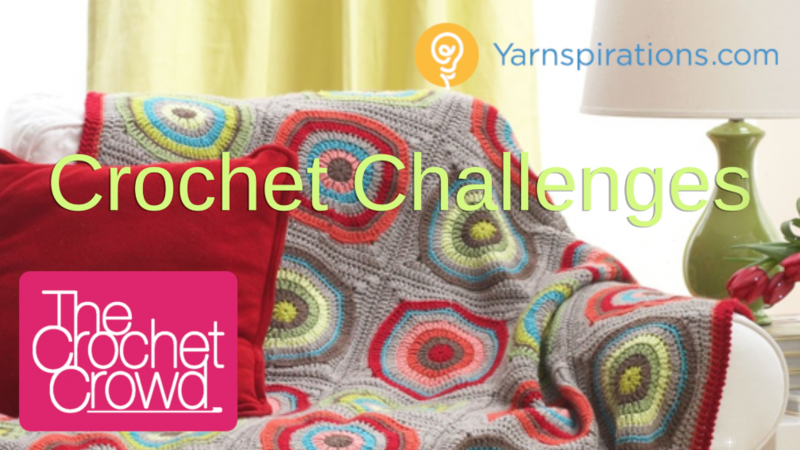 This challenge is being hosted by The Crochet Crowd and Sponsored by our friends at Lion Brand® Yarn Company. The challenge ends Halloween Night on October 31, 2014 at 11:59 pm Eastern Standard Time. For this challenge, Lion Brand is giving away a $150 Yarn Gift Bag that you will love. The winner, as usual, will be randomly drawn from all of the submissions. We will be collecting photos for us all to enjoy as the challenge is completed by crocheters. No advance sign up is required. If you would like advance notice to remind yourself, you can subscribe to our newsletter. 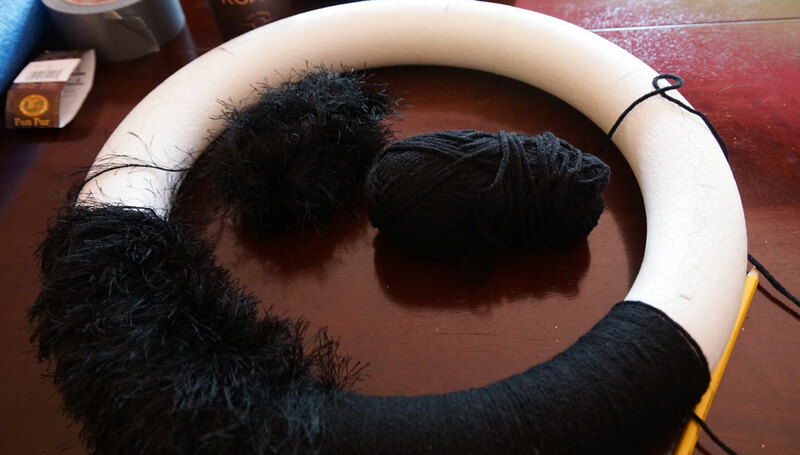 You can use any type of yarn to cover your base wreath or circle. The wreath must be completely covered with yarn. You can crochet a cover or wrap the yarn around the wreath or even make mini yarn balls to glue onto the wreath to cover it. 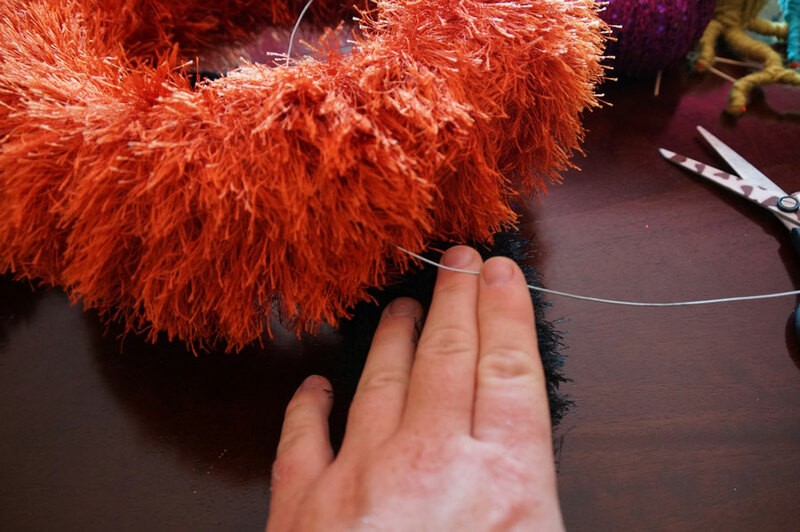 Suggested Yarn is Lion Brand Fun Fur which makes a furry fabulous wreath or Fun Yarn. You can make any size you want with a minimum of 10″ in Diameter. You can choose any colours you wish. You can mix and match your yarns. You are the creator. You may substitute with any yarn to make this project. 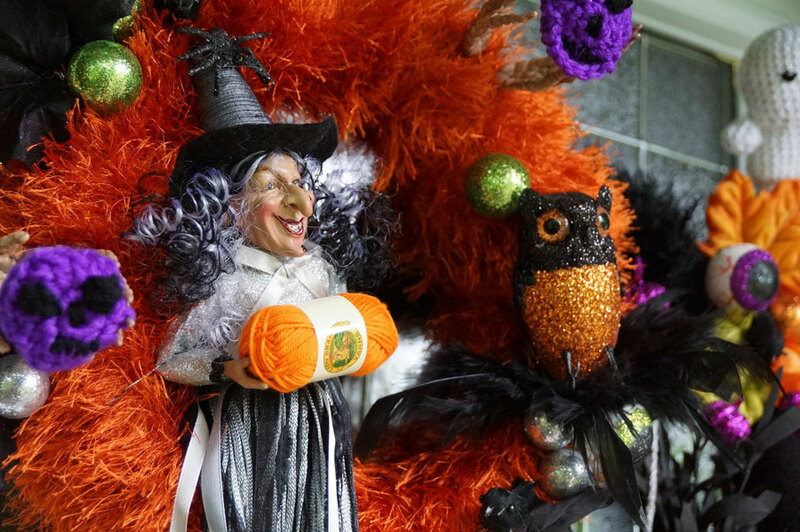 Complete a minimum of 4 crochet Halloween theme motifs / appliqué, and/or amigurmi to be applied per wreath. Please notes, For example, if your motif is made up of a few pieces in order to make the 1 complete motif, that is classified as 1 motif. Diva Dan used Lion Brand Bonbons because he could get a great variety of colours and Vanna’s Glamour for the shimmer and sparkle for the spider webs and the ghost. Diva Dan went beyond and added a few decorations that we had sitting around the house. You can embellish your wreath with mixed media such as ribbons, buttons, dollar store items, ornaments from Michael’s, Hobby Lobbies, JoAnne, AC Moore & etc. Go crazy for Halloween sponsored by our friends at Lion Brand Yarns. Diva Dan’s version is a double wreath with one overlaying the other. This type of wreath presentation would count as two entries. Each wreath needs a minimum of 4 crocheted appliques, motifs or amigurumi. You can make as many wreaths as you want, each completed wreath counts as 1. Here is a list of materials, DO NOT START before September 15th, 2014 as we have guidelines to ensure fairness. 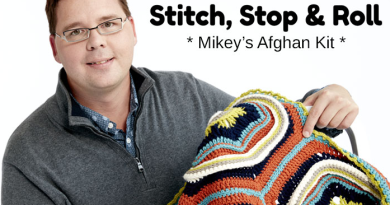 Diva Dan will cast a magic spell putting you on a yarn diet forever! All yarns presented in our Grim Challenge Page on Lion Brand® Website plus any yarns you wish within their entire website . All the yarns presented in our Grim Challenge Page can be found on this Lion Brand® Supplies Page. Use the code and shop for supplies, plus any other yarns you wish within their entire website. Yarn selected may vary by store locations. Go dunking for yarn balls and laugh with witches delight because this challenge is about to take flight. Free shipping offer ends September 30th, 2014, Eastern Standard Time. Wreath Base Suggested Shopping List – 1 Wreath Minimum Required. Diva Dan has made two wreaths for inspiration ideas. You just need to do one wreath. Your wreath has to be a minimum of 10″ diameter. Each finished wreath you do is considered 1 entry. If you do a sample like Diva Dan’s, that will be displayed on Sept 20th, it will count as 2 entries. 10″ Minimum Styrofoam Wreath. Average wreath size for a door is about 15″ diameter. Diva Dan has used two wreaths in his project. One is 10″ and the other is 15″. Inexpensive Tip: Use pool noodles to save money. Duct Tape – if cutting poodle noodles. This is subjective to you and your decorative discretion. This is largely depending on the size of your project. Keep in mind to order and have on extra yarn for your peace of mind. Optional: Use 4 balls of Lion Brand® Fun Fur® to cover the entire wreath. Diva Dan’s example uses a combination of the 2 types of yarn. Your wreath yarn base choices are not limited. Use your scary imagination to use any yarns you wish which include any colours you desire. Keep in mind, we are open minded in whatever Halloween Theme Wreath you can create. There will be a minimum requirement of crocheted items to the wreath. We will give this information upon the launch. Choose wisely. Bonbons® for a great colour variety choice as you won’t need much yarn of any particular colour. Vanna’s Glamor® for a shimmering effect. Fun Yarn® for fun thick colours. You may add mixed media such as ribbons, ornaments, flowers, buttons, beads or whatever you can find. Diva Dan’s wreath is a double layered wreath. Combined with yarn that was wrapped around the styrofoam with crochet motifs added to it. 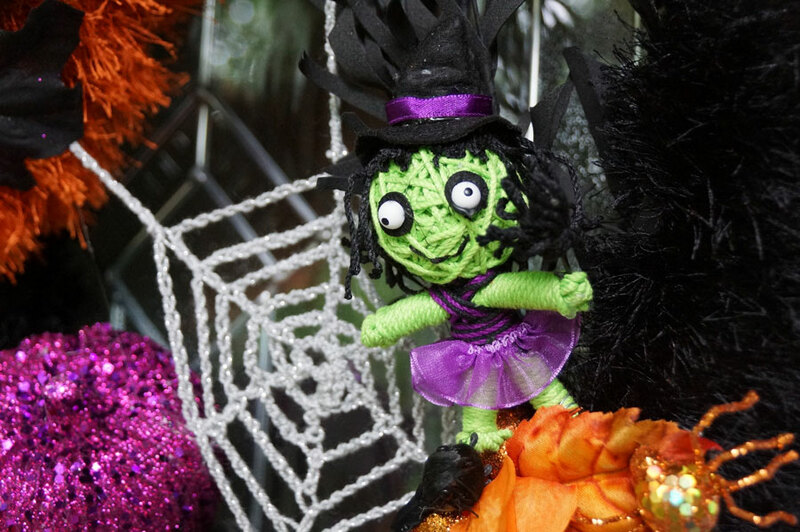 Topped off with pre-made Halloween ornaments purchased at craft stores and dollar stores. 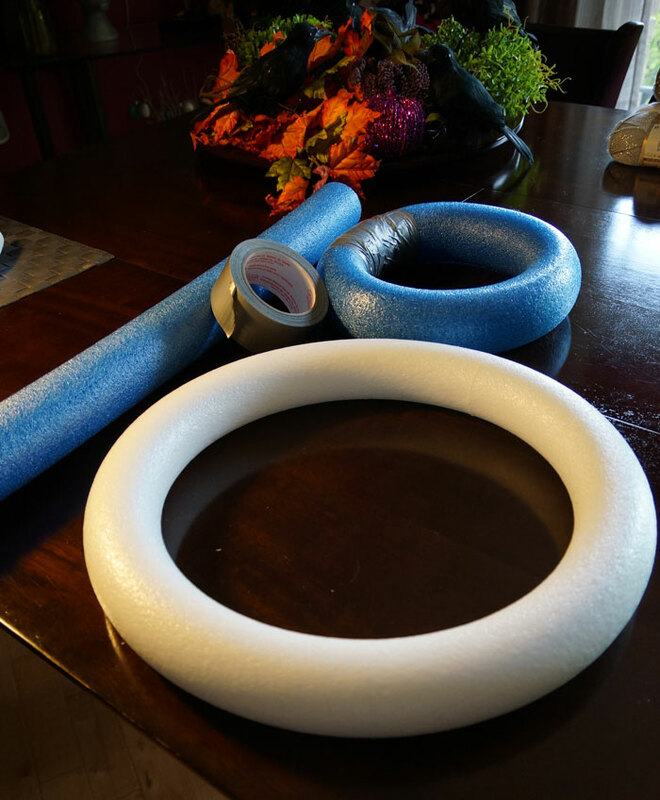 Use a Styrofoam ring or use a pool noodle to make a ring. Pool noodles are far more cheaper and will never know the difference once your project is done. Pool Noodle Made Into Wreath Base. Save money by using Pool Noodles. You can cover the Styrofoam with several options, even mixing up the options to make it far more interesting. You can decide to make a crochet cover to wrap around the wreath and sew along a seam line to permanently attach the cover to the wreath. You can wrap the wreath as it shows below. Diva Dan tacked the beginning and ending with hot glue directly to the Styrofoam to prevent unraveling. He divided up the wreath into 6 equal parts and wrapped the wreath with Fun Fur and Fun Yarn. You can make mini yarn balls and glue them to the wreath. You may have even more ideas on how to wrap the wreath and you use a mix of ideas to make it unique. Grim Wreath Construction. Wrap the yarn around. As you can see below, he opted to have the large 15″ diameter wreath covered with both Fun Fur and Fun Yarn. The smaller 10″ wreath, he decided to use 100% fun fur. Grim Challenge Wreath. All wrapped up and ready to decorate. If you decide to want a double or triple layered wreath. Just remember you need 4 motifs per wreath if doing multi-layered wreaths. Each wreath is considered 1 entry even if affixed together like Diva Dan’s example. Using floral wire, Diva Dan poked the wire through half of the styrofoam on one wreath and half of the other. The Fun Fur covers the wire perfectly. Secure the wire that will permanently attach the wreaths together. Grim Challenge Construction. Wiring the wreaths together. For heavier objects in the wreath or any ornaments that need special positioning where glue isn’t an option. Use the floral wire to attach to the wreath. The witch ornament, eye balls, birds, pumpkin, ghosts, voodoo doll and skeleton hands all have wire that was either glued to the ornament and poked into the Styrofoam and secured. Other ornaments were directly glued to the yarn or attached to other ornaments using hot glue. 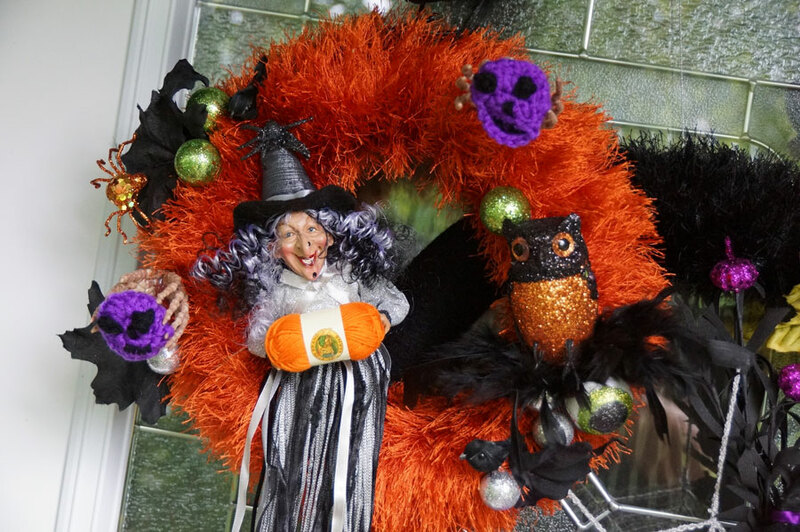 The following photos are examples of Diva Dan’s completed wreath. This may inspire you for ideas. The Lion Brand® Bon Bons were great for the mini motifs used in this project. 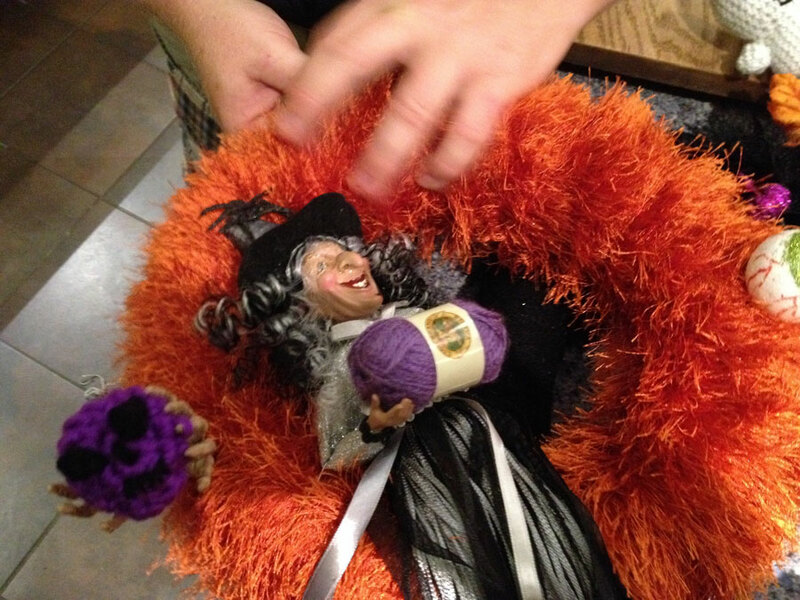 Being yarn artists, we couldn’t help but use one of the Bon Bons for the witch to hold. 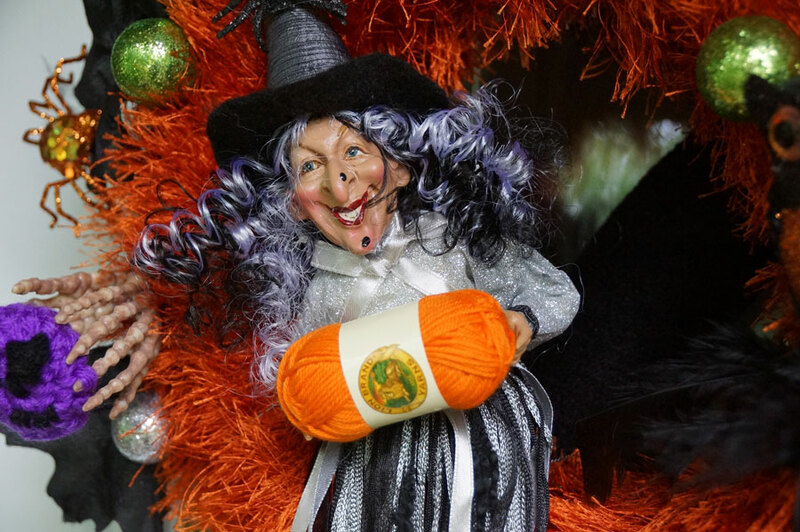 Doesn’t it make sense that the witch is holding a yarn ball on the wreath? Using the store ornaments, the wreath has a 3D look. Using the floral wire helped bring out the ghosts, hands and other objects found within the wreath. Look carefully, there’s more than meets the eye. There are a mix of fake leaves with Halloween theme decor. Do you see the small black birds. Don’t under estimate that smaller decorations don’t always have to be obvious when on the wreath. It adds more visual charm and appeal. Grim Challenge Wreath. Smaller ornaments such as the black birds add a cute touch. Notice the black feathers? That was actually pieces from a feather boa. Sometimes, we already have items lying around that you an incorporate into the wreath. The Voodoo Doll was an ornament but looking at it closely, we could have probably made a version up using our own yarn. Finally, do not over decorate. You’ve spent a lot of time wrapping the wreath with yarn to express your interest in the yarn arts. Let your love for creativity shine through. You may use any yarn you wish. 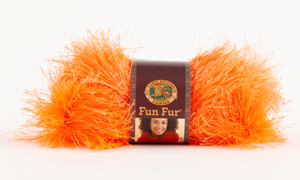 Lion Brand Fun Fur is perfect! You may substitute your yarn for any brand or colors that you desire. You may create any color scheme but it still must be a Halloween theme. The Wreath must be completely covered with yarn. Crocheters Choice: you may add embellishments, borders and etc to the pattern to push your creativity further. We require your photo to show the entire project hung on the door so we know the entire project is done and embellishments are attached. The project photo must be showing all of the project for us to examine it’s completion. Ensure your motifs, Appliqué, and/or amigurmi are completely finished with yarn tails and etc not showing. It’s like giving it out as a gift, we want to the see the photo showing as if you were gifting us the finished product. We will then know you are completely done. Photo Must Be Taken with the Wreath being on mounted to a wall, fence or door. Wreaths lying down on tables or hand held will not be accepted into the gallery as an entry. • You must include your name and full mailing address to qualify. Give us a 3 day window to review and enter your photo into our challenge. Do not resubmit. We do not acknowledge the arrivals of each email, but you may check our assigned gallery for this draw to ensure we have received it. The galleries are in alphabetical order by the assigned name you gave us. Lion Brand® Yarn Company would love to see your creativity as well. Feel free to post your finished wreaths on the Lion Brand® Facebook Page. Posting your photos to our Facebook Wall doesn’t count as an entry. You must send it to us using the email above for us to review and process. If we are concerned about your entry or do not accept your entry, we will email you back with our concerns. Video tutorials will not be provided with this challenge. Where in The World Are You with Red Heart? who won the pretty grim challange? Pingback: Go Eat Braaaaains | go eat worms! Where can I find the email address for grim challenge? Have people from Ireland any chance of entering let alone winning. We don’t have your yarns available to us????? If I post it on Facebook will I still be able to have it entered? No it must be emailed to us. Please continue to retry. Where can I find the photos of the entered wreaths? Heres the link to the flickr page with all the wreaths! Ok, my wreath is complete but I don’t know how to show n tell it on the CC facebook page. Someone help please thanks! I was wondering if the wreath must be Styrofoam or it could be straw wreath that I purchased form jo ann fabrics. The wreath can be made from anything but the wreath needs to be covered in crochet or yarn completely to qualify. I’m so excited for this challenge! I LOVE Halloween!!! WILL THERE BE ANOTHER FALL CHALLENGE FOR THOSE OF US WHO ARE OLD AND GRUMPY AND DO NOT LIKE HALLOWEEN? Next challenge will be ummm… we have ideas but most likely will be Late Fall or Holiday based… We are not sure yet. What about just doing pumpkins? There’s nothing wrong with that… or something like, stand-ups of chimneys using kleenex boxes as the form? *make a skin for it… decorate it like autumn…* Amigurumi of treats and eats and jams and such? there are tons of patterns that could be made into autumnal things without any Halloween association. Oh. My. Wow. Just thought… next year, to increase my teacup collection, crochet one a month to stand for that month and it’s meaning to me! YAY! Our Dollar General in Tampa, FL also has the pool noodles for 25 cents. They were originally $1 and marked down to half off and then another 50% off. They cone in 3 colors: blue red and green. I got 8 of them and if I had somewhere to put them I would have gotten more. Oh wait, it’s a wreath? What am I not seeing? I see references to a supplies list but the link is to buy whatever the supplies are. I see Bon bons and fun fur, how much? What size hook? I only have week! Help! Don’t laugh but it took me a while to figure out what a “poodle noodle” was. So, we can collect items, think of what we’d like to do, but no starting it until the 20th? I’m going to have to sit on my hands!!! I have several packages of bonbons in my stash, and it’s a good thing I have other projects to work on, lol!!! I can’t sit on my hands because one wrist is in a cast. I hope it will come off on September 20 when I go back to the doctor. That should be just about right for this challenge. But I haven’t finished stitch-cation yet! Susan, I highly recommend you sit on yarn, and not your hands, lol! I hope all goes well with your doctor appointment and that you get your cast off. Just take it easy and don’t go right into turbo mode so you don’t re-injure yourself! Lol! I looked at the materials list and it shows Lion Brand “Fun Fur” yarn. When you click on the Lion Brand sight , they only show their “Fun” yarn, not the FUR yarn! I’m guessing it will be the Furry yarn, not the standard FUN yarn? Thanks! Nadette, perhaps this link will help. I made mention of Lion Brand “Fun Fur” and “Fun” yarn, after seeing the whole picture I understand we can use both yarns. How fun will this be?!? The one Diva Dan made will be hard to match!!! Wonderful work!